When Rebel was here on her vacation, I was not. We spent a lot of time with the kids and they were fascinated with the fact that I have friends with diabetes too. This seems to be a common trend with kids. Rebel was showing the kids her pump and Dexcom and BoyMagine told her, “when it has 3 question marks that means it’s not working.” Both Rebel and I were shocked & impressed. I don’t remember having ??? with the kids, but apparently I have! 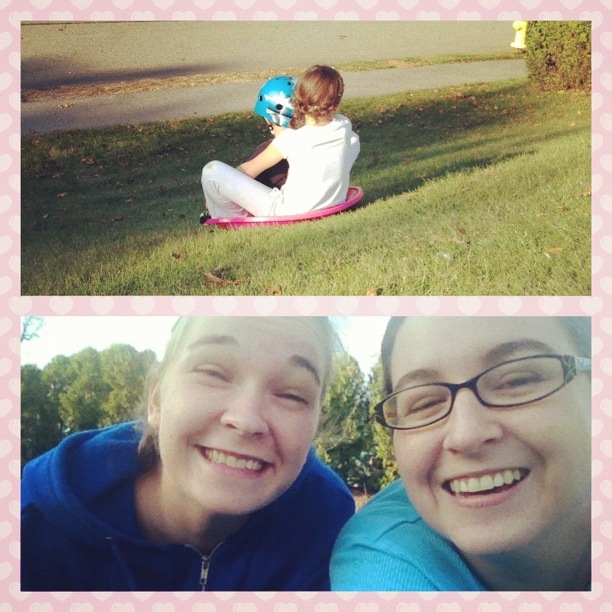 We were outside playing in the neighborhood when a little girl from down the street joined us. After a while she noticed my pump and Dexcom, but didn’t say anything to me. I overheard GirlMagine explain it to her. I don’t remember how she explained the insulin pump, but she explained the CGM as a sugar pump because it keeps track of how much sugar is inside my body. Based on the word pump, this is not the description I would use, but if this is the one that makes sense to her, then go for it! I loved hearing both of these moments because it means they are paying attention and taking things in even when it seems they are not.